In a world where islamophobia runs rife, there’s no denying that Muslim communities across the world have been at the receiving end of increased levels of marginalization, particularly in the west. In the UK, anti-Muslim attacks peaked at record numbers last year, proving the real-life ramifications of an anti-Muslim rhetoric in British society. And when it comes to the media, with tabloids working in ways that further disseminate misconceptions, (ultimately amplifying stigmas at disproportionate rates) it makes the case for independent safe-spaces all the more necessary. Born and raised in London, Raeesah Akhtar set out to create a space that takes back ownership of Muslim narratives. 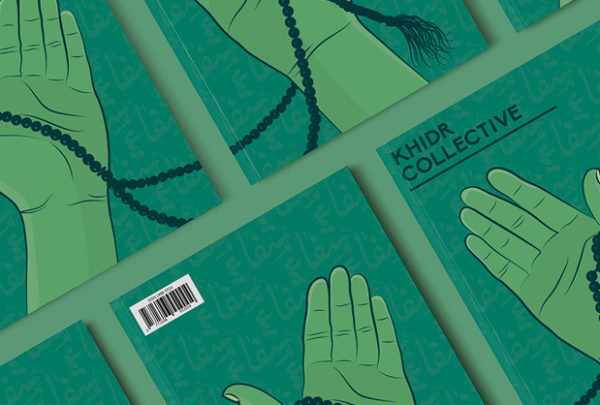 Named after the Islamic figure al-Khadir, symbolizing wisdom, Akhtar launched Khidr Collective Zine—a platform that as she put it, “began as a kind of intervention, to simultaneously disrupt current misrepresentations while celebrating the creativity of Muslim communities and individuals”. We caught up with the 26-year-old editor-in-chief to learn about the collective, how it all started, and why it’s so important to give British-Muslims a voice. The Filet o’ Fish as an iconic symbol of the Muslim experience is also really important to us! This great illustration is by a man of many talents, Rui Da Silva. ?? ✨ On Monday 3 July, the Khidr Collective team will be at #Stratford Station asking *you* what tools young #Muslims need to develop, build and sustain our communities. ✨ We invite anyone who wants to get involved with the collective to come and say hello. Or let us know if you have ideas for a future project you’d like to do or an idea for the next issue of Khidr Zine. We’ll also be selling physical tickets to the zine launch party on 7 July. ✨ Drop by to see us and stay for tea & waffles at Wafflemeister in Westfield at 8pm! ?☕️# ? How did Khidr come together? It was the result of a collective conversation that came in light of the frustrations many of us felt, particularly towards the lack of spaces for Muslims and other marginalised voices to speak for themselves and to contribute to creative industries. What was the process of putting together the first issue like? Well none of us had really created or been involved in a publication before, so it was definitely a massive learning curve. But an exciting one, for sure. We learnt what to do and not to do. Though our production processes weren’t necessarily in place for the first issue, it’s still one of my favourite things we’ve produced because it really covered the purpose and intent of what we set out to do. This stunning artwork comes from our contributor, artist and calligrapher Moustafa Hassan @artofmoustafahassan. A sneak peek of the piece appeared in Issue One of #KhidrZine! What was your key aim? The goal with the first issue was to introduce readers to the ethos of the collective and the purpose of the zine, really. An important element to this was its accessibility. We didn’t want it to exist in an echo chamber of over theorised work. Instead, we wanted to establish its tone as an accessible and refreshing read that allowed both amateur and established artists to contribute. There aren’t a lot of platforms out there created for Muslims, by Muslims, why is having that space so important? It’s important because we live in an age where our identities are inherently politicised. And therefore anything we create is viewed through this lens. We want to step away from that lens and be able to create and publish work without these restrictions. While we might talk about the misrepresentations of Muslims in the media, or dangerous government policies that demonize certain groups, it’s important to remember that these actions all have real time consequences on the lived experiences of communities and individuals. Not only in a tangible way, but the ways in which young Muslims are growing up and the psychological impact these sentiments foster, for example. So, it’s important for us to interrogate our sense of belonging, not only for ourselves but others that feel disenfranchised. Nur Hannah Wan’s beautiful illustrations in the zine captured here through the spirited natural light entering her room. You can buy a copy of #KhidrZine through the link in bio. You’ve also hosted a number of events: can you tell me a bit about the work you do outside of the zine? We have held some workshops in the past around the process of zine-making. With a lot more independent publishing taking place, people are really interested in the logistics and creativity that is involved in a process like this. It’s also important for us to collaborate with artists and other groups. We put on a series of events titled Shadowplay, which was in collaboration with Decolonising Our Minds Society and showcased films, poetry and other art forms from established and aspiring artists in London. Similarly, we’re collaborating with Shubbak and Rusumat for a ‘make your own comic’ workshop at the end of the month with Mehdi Annassi, a Casablanca-based artist who helped found Skefkef, the first Moroccan independent comic magazine in Darja. Supporting the work of artists like this and helping to cultivate the work of others is something we hope to achieve through our events, reflecting and supporting the work of the zine. Do you guys have any exciting new projects coming up? We’re just about to release our third issue of the zine on the theme of frontiers. It’s launching in London on 21st November. We’ll also be launching our website in the new year, which hopes to be an online space of carefully curated work that supports the zine – so watch this space!